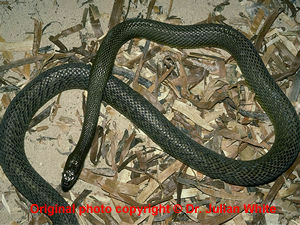 Large in length, slender and robust snake with a relatively long whip-like tail. Can reach a maximum length of over 2.50 metres. Head is elongate, rectangular ( but slightly shorter than O. scutellatus and with a greater slope from the frontal to the rostral ) and distinct from narrow neck. Eyes are medium in size ( smaller in proportion than O. scutellatus ) with round pupils. Head and body scales are smooth and relatively glossy. Head is more round snouted than other species in this genus. Scales in the neck region are small. Fangs are about half as long as O. scutellatus ( about 3.5 to 6 mm ). Warm temperate to tropical arid to semi-arid desert flood plains ( less than 300 ml per annum ) with deep cracking clays and loams, gibber desert plains, dune and rocky outcrops in sparse chenopod and lignum shrubland. Diamantina River and Coopers Creek Channel Country is virtually uninhabited by humans. Diurnal and crepuscular tending to nocturnal in hot weather. Extremely efficient hunter. Its bite is fast and accurate and its venom potent. It usually holds onto its prey until the prey succumbs to the venom. Shelters in rat burrows, deep soil cracks and sink holes and occasionally rock crevices. 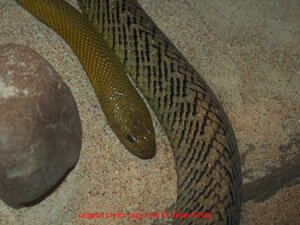 Shy, alert and relatively placid species which may not attempt to escape if approached. If cornered or provoked it will coil in loose, open loops with the forebody slightly raised and strike and release rapidly ( usually more than once ) if within range. Feeds mainly on small mammals, particularly rats and mice, but will also eat birds and small lizards. 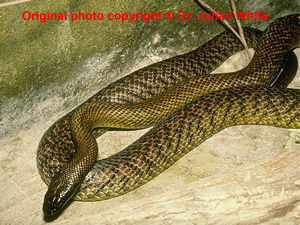 Taipan bites have a very high lethality potential and require urgent assessment. 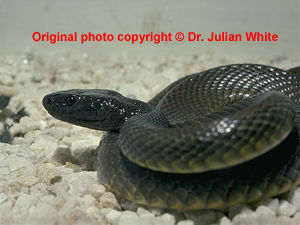 Most cases will develop systemic envenoming, often rapidly, requiring antivenom therapy.